Saturday January 13th 1923 Did some work up stairs. Mr. Pickens called. Mrs. Falk had extra people for dinner. I wrote Warner McCall, Betty, William & Mary, Henly Allen. Went to town in afternoon. Letter from Hattie and papers came. Evening music. To bed early. Sunday January 14th 1923 Went to town with neighbor at ten oclock. To SS and church at Presbyterian. Had dinner with The Folks. Later she and I called at Reimers and went to band concert. I had a letter from Hattie telling me Dr. Smith died the 10th. The same day of the month Will did. Came home with neighbor. Wrote Hattie. Monday January 15th 1923 Was home all day. Did some fancy work. Wrote to Ida, Hattie, Lydia, Ella Wilcox & Gertrude Smith. Took a sleep. 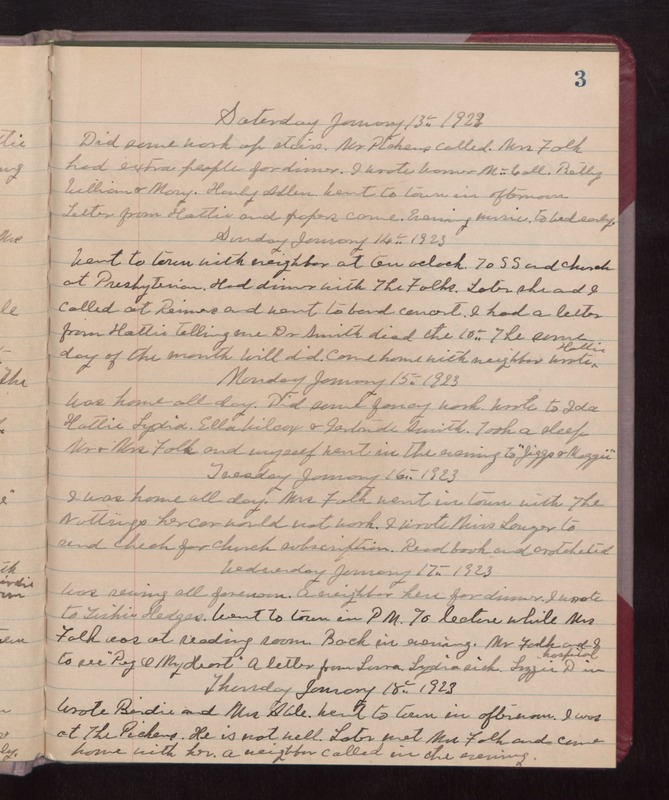 Mr. & Mrs. Falk and myself went in the evening to "Jiggs & Maggie" Tuesday January 16th 1923 I was home all day. Mrs. Falk went in town with The Nuttings. Her car would not work. I wrote Miss Longer to send check for church subscription. Read book and crotcheted. Wednesday January 17th 1923 Was sewing all forenoon. A neighbor here for dinner. I wrote to Tishie Hedges. Went to town in PM. To lecture while Mrs. Falk was at reading room. Back in evening. Mr. Falk and I to see "Peg o My Heart" A letter from Laura. Lydia sick. Lizzie D in hospital. Thursday January 18th 1923 Wrote Birdie and Mrs. Able. Went to town in afternoon. I was at The Pickens. He is not well. Later met Mrs. Falk and came home with her. A neighbor called in the evening.